Surprisingly, no. Exact numbers are hard to come by because a lot of cases are thought to go undiagnosed (which is part of the reason for this whole “awareness month” thing). But the estimate is that endo affects just over 10 percent of people with ovaries during their reproductive years — and about 30 to 50 percent of such people who have problems with infertility or pelvic pain. Odds are pretty good that you personally know someone with endometriosis, even if you don’t (or they don’t!) know they have it. That’s sort of the million dollar question. (No, really. If you’ve got a good working hypothesis, please become a medical researcher and get lots of grant funding. I will love you forever.) 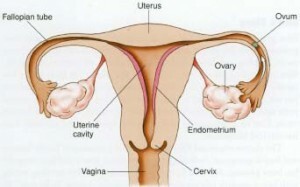 For a long time, the favored explanation was retrograde menstruation. What happens with retrograde menstruation is that, during menstruation, some directionally challenged endometrial cells flow back up out of the uterus, through the fallopian tubes, and into the pelvic cavity. Though retrograde menstruation occurs in a majority of menstruators, most will not go on to develop endometriosis — leading researchers to look for additional contributing factors. Some of those hypotheses include genetics, immune system differences, hormonal differences, and environmental factors. What are the symptoms of endometriosis? How would I know if I had it? The classic telltale symptom would be significant pain during menstruation, though people with endo may feel pelvic pain at other points in their cycles as well. Other symptoms that may suggest endometriosis are diarrhea, constipation, or abdominal swelling, especially in conjunction with menstruation; heavy menstrual bleeding, or bleeding between periods; fatigue; and lowered fertility. While some people will experience a variety of symptoms in their daily lives, others may experience no such symptoms and only discover they have endo when seeking treatment for infertility. A disease with “pain during menstruation” as its main symptom: Doesn’t everyone experience pain with menstruation? Isn’t that why we have the term “menstrual cramps”? It’s true that some pain during menstruation can be normal. However, it’s also true that a lot of endo pain is more than “just” cramps. Many report severe pain levels that interfere with their daily lives, or that don’t reduce to manageable levels even after using heating pads, over-the-counter analgesics, or other common pain relief techniques. Endometriosis can also cause pelvic pain before or after menstruation, around the time of ovulation, during sexual activity (penetrative or not), during penetration (sexual or not), during urination, and during bowel movements. Though folks vary in the type(s), frequency, and severity of the pain they experience, endometriosis has the potential to cause significant daily pain for some people who have it. Generally, a good rule of thumb is that if you’re experiencing pain that interferes with your day-to-day life, it deserves to be taken seriously, diagnosed, if possible, and managed — regardless of cause. While endometriosis is often managed by a specialist, some Planned Parenthood health centers can help address painful periods. Stay tuned for future installments, where we will look at the diagnosis and treatment of endometriosis, along with a closer look at endo and fertility. This entry was posted in Sexual Health and tagged bladder, bowel, endo, endometriosis, Endometriosis Awareness Month, endometrium, fallopian tubes, fertility, infertility, lesions, menstrual cramps, menstruation, ovaries, pain, painful periods, pelvic pain, retrograde menstruation, symptoms, uterus by Tori. Bookmark the permalink.